Maurice Andre San -Chez and Charles Peoples III. All photos by Steven Ho. R. Shawntez Jackson, Charles Peoples III. “You can change a body, but you can’t change a soul. The heart wants what it wants.” Chris Colfer in Stranger Than Fanfaction. 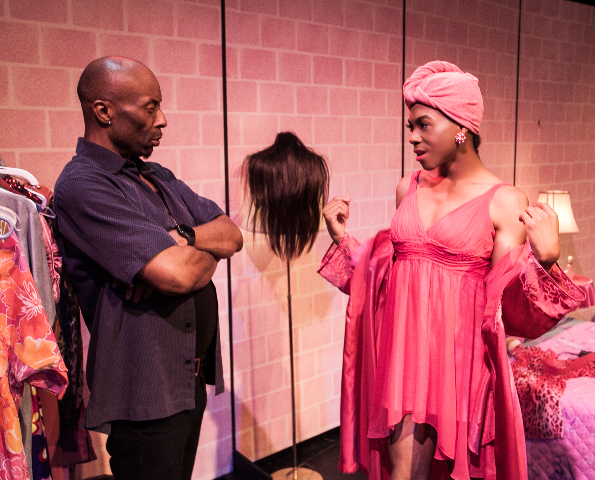 The thought provoking and engaging The Legend of Pink by Kheven LaGrone receives its world premiere at Theatre Rhinoceros. 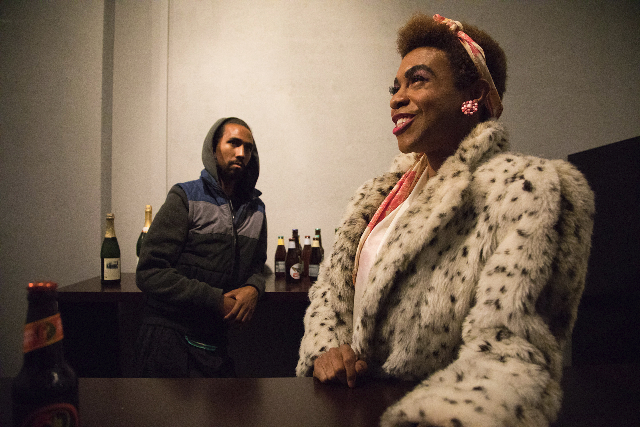 Set in West Oakland in1989, it recalls a time when all biological men like Pink who dressed in women’s clothes were known as transvestites – focusing attention on the clothes that they wore rather than their gender identity or their humanity. At that time, antipathy toward anyone not conforming to the traditional binary sexual typology of heterosexual man and woman ran much stronger than today, particularly in the African American community. Pink is a flamboyant, self-indulgent, black, biological man, who is totally committed to life as a woman at a time when transgenders lack networks and support systems of like people, but rather live alone in a harrowing world of isolation. But this story is not one of Pink’s confronting a hostile outside world, but rather the intimate side of relating to two intimate friends and one newcomer to her life. As such, it largely avoids much of public and generic scorn that she might have to deal with outside the boundaries of her apartment. The action centers on Pink’s relationship with Ace, a macho but sexually conflicted male lover, and Nikki, her closest “friend,” but whose motivation for associating with Pink is unclear. Enter DeShawn, whose real name is Bradford, from a prosperous San Francisco family, who grew up in white environments but is drawn to the ‘hood to share a more genuine black experience. The Legend of Pink also surfaces important social issues outside the transgender realm. One is communication style by blacks who are socialized in mostly black communities. In several scenes, Ace or Nikki speak to Pink with such hostility and deprecation that it is hard to believe that they can possibly be friends. But this exemplifies one of the divides between blacks and whites in this country. Whites are more likely to feel threatened by blacks because they are unable to distinguish posturing from real threat. Finally, there is the issue of white on black discrimination, endless in time and in scope. A brief but poignant vignette concerns DeShawn’s talking about having to always be a model – to be the good black kid, knowing that the same bad behavior by white kids would be overlooked, but in a black kid would be verification of bad character. These themes are both a strength and weakness in The Legend of Pink. Although they are of monumental importance, they deflect from what the title suggests as the essence of the narrative, the life and times of Pink. In fact, some of the most significant events concern DeShawn, including a riveting white-face sequence drawing from Paul Lawrence Dunbar’s poem We Wear the Mask. While the narrative is entertaining and instructive, it could use tightening to focus more exclusively on Pink and the tragic plight of transgenders suffering broad-based discrimination and degradation. Alternatively, it could expand into a wider conceptualization and title. Individual episodes are well constructed and often well and intensely portrayed, but pacing and continuity could improve. 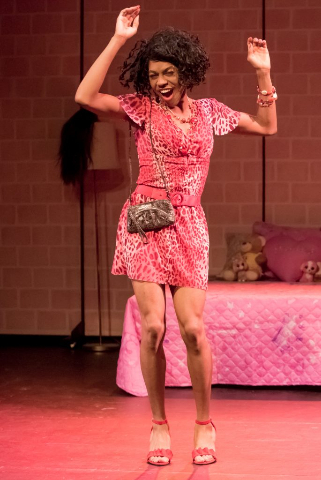 Rhino has scored a casting coup with Charles Peoples III as Pink. He has both the convincing look and affect to characterize Pink, capturing fantasy and rejection with equal skill. Maurice André San-Chez as DeShawn, R. Shawntez Jackson as Ace, and Phaedra Tillery as Nikki round out the talented ensemble. Each has highlights, though there are times when they don’t seem totally true to character. Director AeJay Mitchell combines the stage and acting elements effectively. Despite whatever weaknesses, LaGrone’s play strikes many nerves and should satisfy anyone with interest in the topics, and hopefully those without any specific interest. As a broader social commentary, it bears noting that that the tragic plight of transgenders, which encompasses all manner of scorn and discrimination, is receiving greater public recognition and that acceptance in many ways is on the rise. Yet backsliding abounds. The political antics in states like North Carolina and Texas are remarkable for wanting to create a horrible dilemma as a solution for a problem that doesn’t exist. And Donald Trump’s order to dismiss transgenders from the military is so crassly discriminatory, unsupported by military leaders, and on the wrong side of history, that one wonders what kind of perverted ideas encumber his mental faculties. 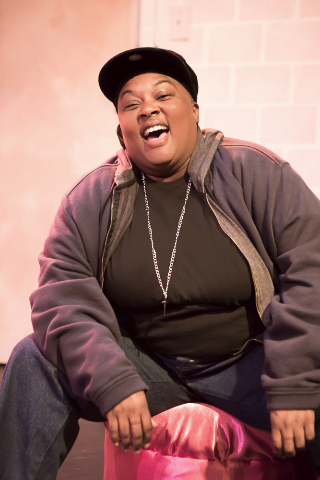 The Legend of Pink, by Kheven LaGrone, is produced by Theatre Rhinoceros and plays at Gateway Theatre, 215 Jackson Street, San Francisco, CA, through September 30, 2017. Reposted from For All Events.